New Zealand\'s Daniel Vettori (right) plays a shot as South Africa\'s Quinton de Kock looks on during their World Cup warm-up match in Christchurch on Wednesday. Christchurch: New Zealand had a resounding win over South Africa while Sri Lanka were beaten by Zimbabwe in two surprising results from Wednesday's pre-World Cup warm-up matches. World Cup co-host New Zealand continued their impressive recent form by beating highly-favored South Africa by 134 runs. Brendon McCullum made 59 and Kane Williamson 66 as New Zealand scored 331 for 8 in 50 overs before bowling out South Africa for 197 for a morale-boosting win. At the same time, Sri Lanka's confidence nose-dived when Zimbabwe surpassed their total of 281 for 3 in only 45.2 overs, led by Hamilton Masakadza who made an unbeaten 117 from 119 balls. Sri Lanka, coming off a 4-2 series defeat in New Zealand, had their confidence further dented by the Zimbabwe defeat, just three days away from the tournament opener against New Zealand. Dimuth Karunaratne top-scored with 58 in Sri Lanka's 279 for 8 as it batted first after winning to toss at the Bert Sutcliffe Oval. Jeevan Mendis made 51 and Mahela Jayawardene and Lahiru Thirimanne both made 30 but none of the top-order batsmen was able to go on and make a big score. Zimbabwe made surprisingly easy work of running down that total on the same pitch on which they reduced New Zealand to 157 for 7 in a rained-out match on Monday. After slipping to 35 for 2, Brendan Taylor (63) put on 127 for the the third wicket with Masakadza, who then saw Zimbabwe comfortably home in an unbroken 119-run partnership with Sean Williams (51). Williams produced an outstanding all-round performance, taking 3 for 35 from 10 overs of left-arm spin during Sri Lanka's innings. 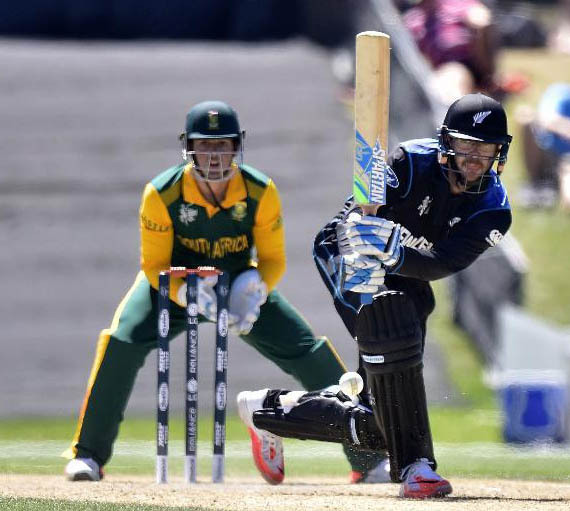 New Zealand was equally emphatic in its win over the Proteas. The innings of McCullum and Williamson, with support from Ross Taylor (41), Martin Guptill (26) and Grant Elliott (24) set a strong platform for the Black Caps and late contributions of 27 by Daniel Vettori and 33 not out by Nathan McCullum took it well past 300. South Africa were in desperate trouble at 62 for 6 with captain AB de Villiers - returning after a slight hip injury - out for 24. Jean-Paul Duminy made 80 from 98 balls and Vernon Philander 57 from 84 balls but their slow partnership left South Africa with little chance of running down New Zealand's total. South Africa were all out in the 45th over and will now reappraise the challenge they face in their opening match, against Zimbabwe in Hamilton on Sunday.